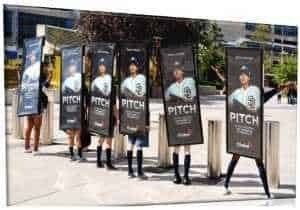 Global Television recently conducted an out-of-home advertising campaign in Toronto to promote its new television series Pitch. Developed in association with Wild On Media, the campaign consisted of vehicles outfitted with LED display screens and 15 promotional workers wearing baseball uniforms and poster-sized ad executions. These workers also distributed branded packages of chewing gum. The vehicles were located in the same area, displaying an audio-visual ad. The initiative took place on Sept. 10 and 11 outside the Rogers Centre. The effort later moved to King St. to reach Toronto International Film Festival attendees.